It’s no secret that everyone loves getting mail. With the accessibility of emails, texts, messages and chats, snail mail is quickly becoming a thing of the past. Although the progression from attaching a note to a pigeon to pushing a send button is impressive, there is still a rush of excitement associated with receiving a hand-addressed envelope in the mail. I’m always dumbfounded when I watch musicians and artists accept an award and then begin their speech as if they have no idea who to thank. They ultimately always forget someone. Be prepared. Keep a list of those people you need to thank. Write down a name each time you receive a wedding gift or the names of those involved with hosting a shower for you. You certainly don’t want to forget anyone. It’s a bit easier to remember to thank someone when you have a tangible gift in front of you, but don’t forget about your suppliers and vendors. It isn’t necessary to thank every single vendor, but it is polite to thank those that went above and beyond and exceeded your expectations. It’s great that you posted a generic thank you on your wedding website, but your thank you cards need to be a bit more personal. Take the time to write a meaningful message on each thank you card and don’t just sign your name. Be sure to use personal stationery or stationery that corresponds with your wedding invitations and theme. Take the personalization up a notch and have your photographer take a picture of you holding a handmade thank you sign at the end of your wedding. You can then use the picture to have thank you postcards created. I feel your pain. I am a post-college recovering procrastinator. Despite the fact that the wedding is over and your stress level has decreased dramatically, don’t procrastinate in sending your thank you cards. 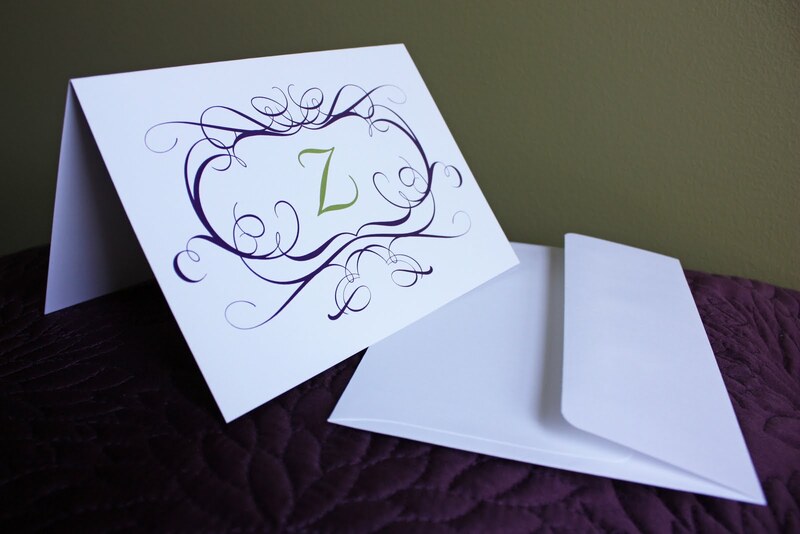 Ideally, your thank you cards should be sent three months following your wedding. Why not work on your thank you cards while you’re on the plane flying to/from your honeymoon? Or set a daily goal to complete X number of thank you cards to make it easier than trying to complete all 200 at one time. Are you in month six, eight or even twelve following your wedding? Don’t stop. A late thank you card is better than no thank you card at all. Personalized thank you cards are a wonderful addition to your wedding stationery package. You can order them to match your wedding invitations or emDOTzee can design them to look completely different. You can also include your names, monogram or last name instead of “thank you” so that you can use any extras as notecards in the future. Picture thank you cards are also becoming a popular way to say thank you to your guests. You can include your favorite picture from the wedding or ask your photographer to take a picture of the two of you holding up a “thank you” sign. In honor of thank you notes and personalized stationery, congratulations to Meredith Barlowe of Lenoir, North Carolina! 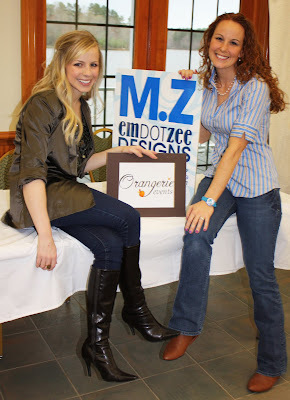 Meredith is the proud winner of customized stationery just for being a fan of both Orangerie Events and emDOTzee. It’s our little way of saying thanks. Stay tuned and in a few weeks, we’ll feature Meredith and her custom stationery in an upcoming blog. Until then, thank you for your support and for spreading the word about Orangerie Events and emDOTzee Designs! It’s amazing how your priorities change as you get older. Long gone are the days when I looked forward to the weekend because it was equivalent to going downtown and staying up late. I now look forward to the weekend because it means I’ll get to sleep a little bit past 6:30 in the morning. On a good night I get 9 hours of sleep. On a bad night I get 8. Perhaps I’m a sleep addict. Within our household, we represent both ends of the spectrum when it comes to sleeping patterns. I can fall asleep on the couch, in a chair, probably even in the shower if I wanted. Once I’m asleep, I stay asleep. Chase, on the other hand, doesn’t fall asleep as easily. His nightly routine consists of frozen eyes masks, therapeutic stretching and sleeping pills. I actually pity him for not being able to drift into dreamland as quickly and peacefully as me. I also pity myself for having to lie in the bed next to him while he thrusts his legs behind his head to stretch. Considering the love fest between my memory foam pillow and me, sleep interruptions need to be kept to a minimum and need to occur only when absolutely necessary. A few weeks ago, Chase and I took a weekend trip to the beach. We arrived late Friday night, unpacked our things and headed to bed. Around 3am a steady pounding noise woke me up from my precious slumber. Although my eyes shot wide open, the rest of my body remained frozen as if I was playing dead for an impending bear attack. I’m easily freightened when it comes to strange noises in the middle of the night. I waited until I was certain that something strange and unusual was taking place outside of the bedroom door. I nudged Chase and pulled the “did you hear that” card. He normally responds with a half-asleep slurred answer but this time, he too was awake from the odd noises echoing throughout our room. We stayed in bed and evaluated whether it was Scottie trying to break into his dog food as he had done once before or whether we were actually dealing with an intruder. After listening to the constant thumping for a few minutes, I honed into my inner Sherlock Holmes and hypothesized that the noise was coming from the back patio that extends off of the bedroom. I hesitantly slid out of bed, walked to the corner of the sliding glass door and reluctantly peeled back the curtain. Through the darkness I could see only the shadow of something rolling around the deck. Chase, a bit braver than me, walked to the door, opened the curtains and turned on the patio lights. And there, right before our eyes, were the two masked bandits that had been causing such a ruckus. Apparently, two raccoons had decided to sneak away for a late night rendezvous and had decided that our deck was the perfect place to…um…consummate their relationship. A glass patio door is all that stood between us and the promiscuous raccoons. In between bouts of love making the two raccoons would wrestle, thus creating a loud and pounding sound effect. They didn’t care if we turned the light on nor did they mind that we stood there and watched. They were too enthralled with one another to notice anything else going on around them. And if anything is going to disturb my sleep in the middle of the night, something as unusual as two nocturnal mammals making whoopee is certainly a valid reason. I thoroughly enjoy watching American Idol. I’m not ashamed to admit it. Whether I really like the contestants or not (which I haven’t been overly impressed with this year) I watch religiously each week and critique them the moment they begin singing. I’ve actually auditioned for the show twice. Unfortunately, I wasn’t exactly what they were looking for and I didn’t have a dramatic sob story to unload on National Television. Nonetheless, I’m not bitter and continue to have routine Wednesday morning conversations with my Dad to discuss the previous night’s performances. I was a fan of Anoop Desai from Season 8. Yes, I did favor him a little more than I should have simply because he was from North Carolina, but I also really enjoyed hearing his unexpected soulful voice. A few days ago, I discovered that Anoop and I have something else in common other than being North Carolina natives – we both like weddings. Anoop is hosting a contest in which one lucky bride-to-be will win the ultimate wedding singer. If you like Anoop and have been looking forward to his cd release, entering is a bit easier for you. If you don’t really care about his cd but would love to have him perform at your wedding, you’re going to have to bite the bullet and fork over some money for his cd. To enter the contest, simply visit his website, pre-order a copy of his new cd and email the receipt to anoopdesaibride@gmail.com. His cd will be released on May 4th, so you must enter within the next few weeks. The only stipulation with having Anoop perform at your wedding is that it must take place within the United States on or after July 16th. So what are you waiting for? Go put a little Anoop Dog in your life and you may end up getting Anoop at your wedding! For many readers, today reminds you that you are a procrastinator. You are quickly gathering receipts and W2s in preparation for a date night with your accountant. You’re submitting your tax information just in the nick of time. For other readers, today is just another Thursday. You filed your taxes months ago. No matter which category you fall into, we can all agree that today’s focus is on money. It’s all about the lack of it, the need for it, the desire to save it and the hope of getting more of it back from Uncle Sam. In today’s economy, it’s not uncommon for brides and grooms to be budget conscious. A lot of couples are paying for their weddings without assistance from their parents or relatives. Other couples are just more aware of how silly it can seem to spend so much money on one day. No matter what your budget is for your wedding, there are numerous ways you can save. In honor of “Tax Day,” this installment of “Two Scoops” will give you some tips on how to save in regards to planning your wedding and creating your wedding invitations. Planning a wedding is stressful enough without having to worry about budgeting. Money dictates your dress, your venue, your food and every other detail. If you’re planning a wedding and worried about staying on budget, Orangerie Events has some helpful tips to help maintain your sanity and your bank account! 1. Wedding Coordinator? I’m on a budget! For brides on a $10,000 budget, it may seem unrealistic to hire a wedding planner or coordinator. Why allocate precious funds for someone to coordinate your wedding when your great-aunt Lucy can direct the ceremony and reception? The truth is hiring a wedding coordinator can actually save you money. The number one stress involved with planning your wedding is controlling and maintaining your budget. Orangerie Events can play a key role in helping you to stay on and under budget. By obtaining vendor quotes, negotiating costs and partnering with preferred vendors, Orangerie Events can actually save you money in all of your budget line items. Just hiring a day-of coordinator? That’s OK. Orangerie Events will still help you stay under cost by working with you to make sure you’re getting the most out of your money to maximize your budget. There is one huge misconception among brides pertaining to linen rentals. Most brides think that white linens are the least expensive and that colored linens cost more. In reality, the basic poly linen cost the same whether it’s white, red, yellow, black or any other color. The price starts to increase when you pick out a different linen fabric such a satin or bengaline or when you look into patterned and detailed linens. So go ahead, add a splash of color to your tabletop. When picking out a wedding favor for your guests, it’s important to ask yourself, “Would I like getting this?” If your guests can use it, eat it or smile about it, you have a favorable favor. Save some money by making a donation to a local charity instead of purchasing individual favors for your guests. You’ll cut cost by picking the amount that best fits your budget and your guests will appreciate your generosity. It’s a money-saving trend that gives back to the community and is extremely popular for 2010. Even if you don’t consider yourself crafty, there are many do-it-yourself projects that can save money when planning even the smallest wedding details. For example, for a fall wedding last November, Orangerie Events designed and created all of the flowers for the wedding. Everything from the centerpieces to the boutonnieres, Orangerie Events assembled. Instead of spending $2000 on flower arrangements, the couple spent $200. Looking for a focal point for your reception? Why not re-create the wooden backdrop seen in the picture here? Orangerie Events created this display by attaching old wooden shutters after staining them with a stain found on sale at Home Depot. The frames were purchased at Michael’s for $1.00 each and then spray painted with selected colors. This would make a beautiful photo display at your wedding and costs around $25. emDOTzee Designs was started with the idea of creating beautiful invitations at prices brides can afford. So you have come to the right place for budget-friendly stationery. Below you will find some tips of how to save even more money when choosing which invitations and options are best for your wedding and your budget. This inexpensive single-card format will make a statement without breaking the bank. This bride asked to incorporate many shades of blue and several different fonts to create her unique wedding invitation. And this is the only card she sent out. She opted to receive her RSVPs on her wedding website – saving money on the printing costs and the postage. A great modern way to save on printing and postage is to pick save-the-date and RSVP postcards, rather than the traditional cards with envelopes. You get to use cheaper postcard stamps and won’t have to purchase the matching envelopes. Another plus: your address is already printed on the back of the postcards, so that saves you time as well. For brides who want to add pretty metallic card stock, colorful pocketfolds or ribbon and bows to their invitations but can’t seem to afford it all, getting all the pieces from emDOTzee and then assembling them yourself will save you money. 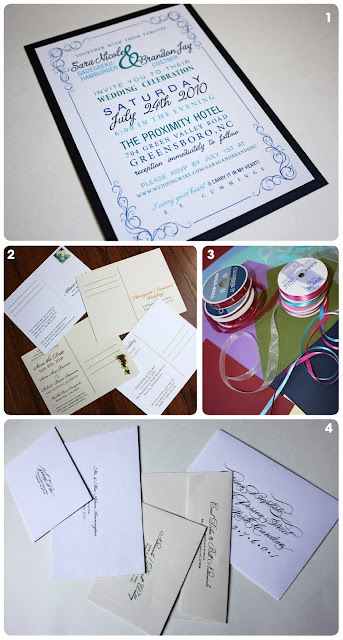 emDOTzee will design and print your invitations and then hand the materials over to you. If you want to add ribbon, we will provide the invitation and backing card stock with holes already drilled in the top, so all you have to do is have a ribbon tying party with your bridesmaids to get them done. Want your envelopes to look as professional as the cards inside, but can’t afford handwritten calligraphy? emDOTzee offers return and recipient addresses printed directly on your envelopes with the same fonts used in your invitations for far less than a traditional calligrapher. Get return addresses printed for only $0.25 each and recipient addresses for $0.50 each. There are plenty of inside tips and tricks to saving money when it comes to planning your wedding and selecting your invitations. Got questions? Feel free to contact Orangerie Eventsor emDOTzee. We’d be happy to talk with you and offer some suggestions. 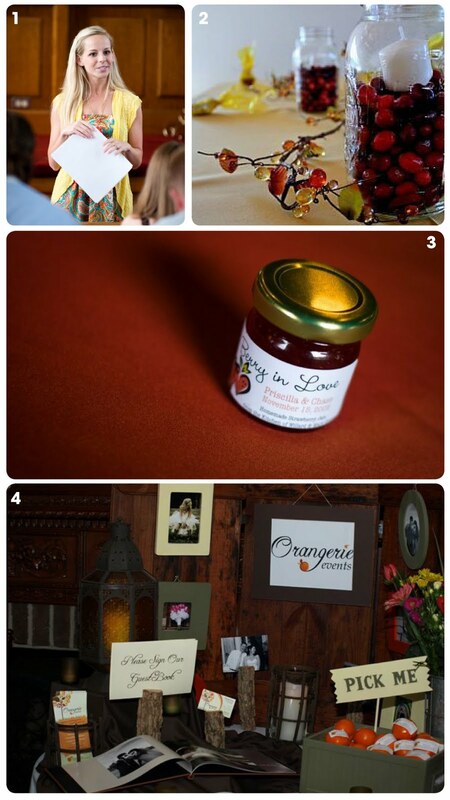 Don’t forget to become a fan on Facebook of Orangerie Events and emDOTzee. By befriending us, you have the opportunity to win customized stationery. Hurry, you must become a fan before April 30th. Don’t wait like you did with your taxes. One scoop is ok, but “Two Scoops” are better! Orangerie Events and emDOTzee Designs are teaming up to offer a unique guest blogging experience for our readers. Every other Thursday, the “Freshly Squeezed” Orangerie Events Blog and the emDOTzee Designs blog will team up to feature beneficial articles, tips and ideas pertaining to wedding and event planning. By reading “Two Scoops”, you’ll get the perspective of an experienced wedding and event coordinator as well as the perspective of a talented and knowledgeable graphic artist. Entering the contest is easy. Simply become a fan of Orangerie Events and emDOTzee on Facebook by April 30th and you’re automatically entered into the drawing. If you’re already a fan, you’re already entered. Could it be any simpler? The winner will be randomly selected on May 1st and will be featured in an upcoming “Two Scoops” blog. So spread the word to your friends and family and encourage them to befriendOrangerie Events and emDOTzee on Facebook. We already know you spend most of your day checking statuses and stalking strangers. You might as well enter a contest while you’re at it. Be on the lookout for the next “Two Scoops” installment on April 15th. Since April 15th is the dreaded tax deadline, we’ll be talking about budget-friendly ideas for your wedding or event. Remember, whether you’re eating ice cream or reading a blog, “Two Scoops” is better than one! Here is a sample of the free note card design. If you win, you’ll be able to customize these cards with your own colors, font and monogram!